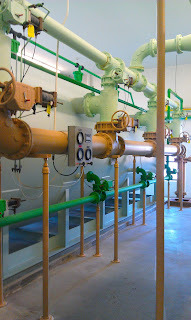 The Frankfort, Illinois water plant, designed by Robinson Engineering, was awarded an APWA Project of the Year. Before the water treatment project began, the Village of Frankfort faced high levels of iron in Well #7 and started looking for a way to provide clean drinking water for the community. Robinson Engineering, Ltd. was commissioned soon after with the design and construction observation. During the contracting process, Robinson Engineering saw an opportunity for Frankfort to save money by dividing the project into two contracts; one contract for the filter manufacturer and the other for the installation of the filters. The Village saved roughly over $50,000 with two separate bidding contracts. 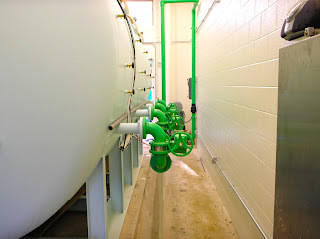 Frankfort’s water facility started with the removal and replacement of its controls and chlorination system. The new equipment brought into the plant included three 10’ D x 36’ L horizontal pressure filters and a Tonka Simul-Wash™ backwashing system. The Simul-Wash™ process ensures quality water, provides cost savings by approximately 50% of backwash wastewater and guarantees against media loss. Since the end of the project, Well #7 has shown a 95% reduction in the iron and the plant has increased capacity by 600 GPM. Not only is the community happier with their drinking water, but the project was completed on time and under budget.